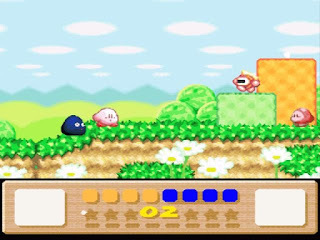 Kirby's Dream Land 3 is a platformer and the follow-up to 1995's Kirby's Dream Land 2 (Nintendo Game Boy). Your mission across the game's five worlds is to save the planet of Popstar by getting rid of the black clouds that are controlling King Dedede and his minions. As usual, Kirby can inhale enemies and copy their powers, but here he's joined by a cast of six animal friends that can be ridden for extra abilities. Additionally, either the CPU or a second player can control Gooey, an ally that has the same moves as Kirby and who can be thrown into action at any time. Strangely, the game's speed feels dramatically slower than previous Kirby titles, and even though you can dash the screen doesn't always scroll far enough which can lead to cheap hits where enemies attack out of sight. The level design is bland with barely any memorable moments to stop the drudgery of moving from left-to-right and you'll also see lots of repetition where the exact same layout or enemy placement is duplicated in the same level. Using Gooey is a cool idea, but it's pretty useless as unlike in Kirby Super Star (1996, SNES) using an ally takes away two of your hit points. To be honest though, with the game's low difficulty and short length it's a mechanic that's not really needed. However, I do like the playable animals and the fact that they all have different abilities (depending on your current power-up) adds to the replayability. Also, the bosses are all enjoyable and even though Whispy Woods appears yet again it's a great twist that the tree starts chasing you in a forced scrolling battle! The graphics are stunning with a gorgeous pastel look, and the special effects (such as rolling log bridges) are mind-blowing for the time. Kirby's Dream Land 3 is a massive disappointment after the previous two games and its uninspired gameplay and level design is hard to fathom in a series so chock full of highlights. Despite its top-notch visuals, it's a rather soulless platformer that fails to excite for the majority of its all-too-brief adventure. Random trivia: An extensive debug menu can be accessed by changing the ROM address in a HEX editor.